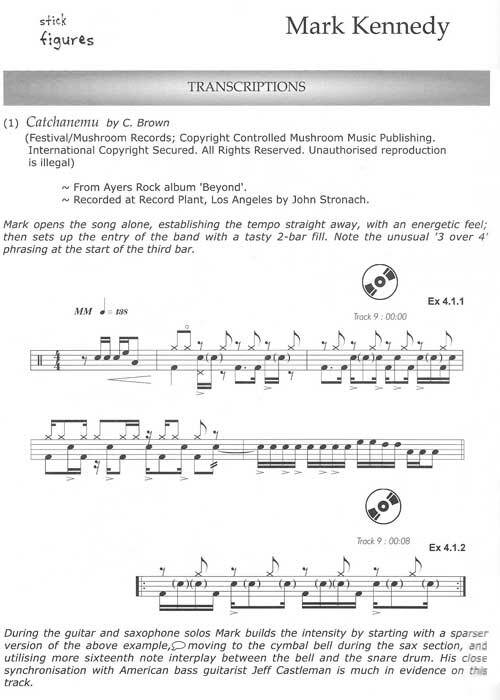 "Stick Figures" - a 132 page book and companion CD showcasing the art of drumming. Featuring some of Australia's most famous drummers. 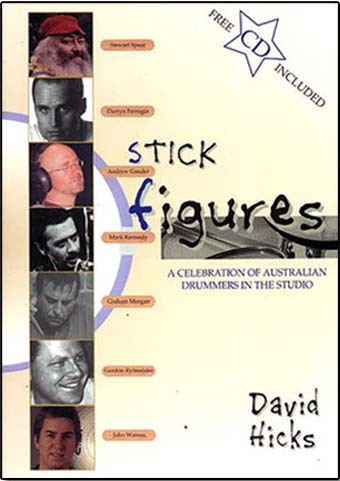 Compiled by well-known Melbourne percussionist and educator, David Hicks. Informative and instructional, "Stick Figures" enables the percussion student to advance their skills and add flair to take their drumming to a new level. Increasing sound choices in your equipment setup. I think this is excellent! Well put together with all the bio and educational stuff! There is so much here to learn from and be inspired! I have always been very moved by the Australian drummers. It is humbling to hear them all. Now the world gets to hear! ...some really great music. The variety is HUGE! I play this all the time in my car! 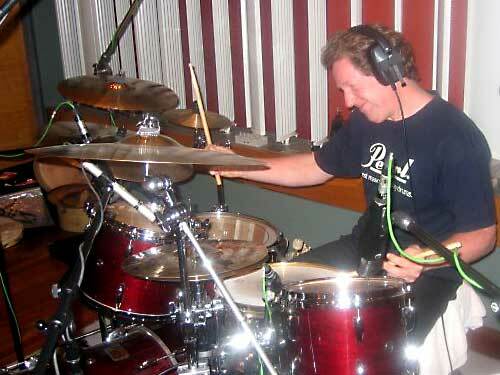 informative background information, drum set ups and interview snippets on each musician. 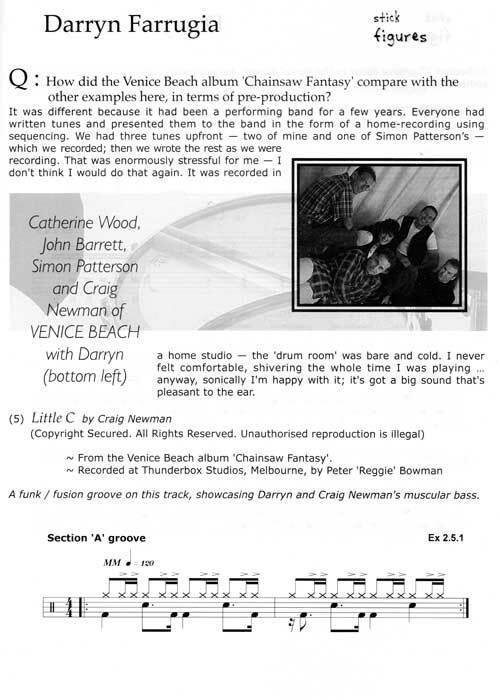 CD enabling the reader to dissect transcriptions, and hear just why these musicians are held in such high regard essential reading for anyone even vaguely into the art of drumming. Well-known Melbourne percussionist and educator, has brought together seven of Australia's top drummers for this close-up look at their work in recording studios. 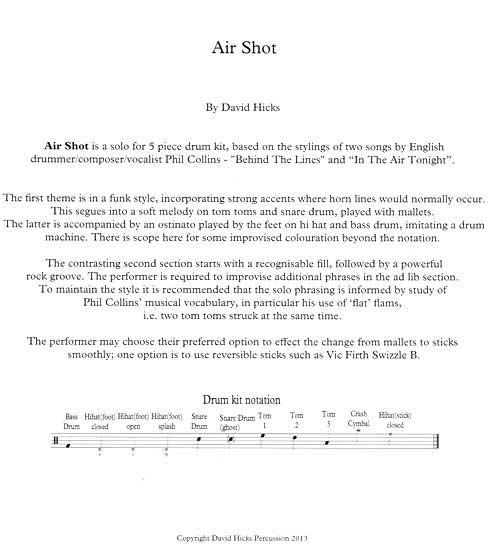 "Air Shot" is a solo for 5-piece drum kit, based on the stylings of two songs by English drummer / composer / vocalist Phil Collins - "Behind the Lines" and "In the Air Tonight".